The Attitude Determination and Control System (ADCS) is a crucial subsystem of a spacecraft. It provides pointing accuracy and stability of the payloads and antennas as critical parts of the S/C operation and the mission success. The Space Engineering department is well recognized for its work on the design, development and launch of educational nano-satellites. The study and development of a complete ADCS system started within the Delfi-C3 CubeSat program being a passively controlled S/C without 3-axis stabilization. A full blown ADCS system including 3-axis pointing control and stabilization was developed within the Delfi-N3Xt CubeSat program. Key areas are hardware development and characterization (reaction wheels, sunsensors, magnetorquers and magnetometers are developed within the chair SSE), attitude estimation algorithms (see also the ESEO project), control loop design, system development and testing. The development of micro-thrusters, a reaction ball subsystem, water-propelled micro-resistojets, mostly based on MEMS technologies and huge momentum bias wheels with frictionless magnetic bearings are part of the R&D development scope. The MEMS components of these thrusters are manufactured through a collaboration with the TU Delft’s Else Kooi Lab. The study and development of the ADCS is SE related to small space instruments and sensor systems development for this class of small satellites (CubeSats, PicoSats). In fact it is one of the most important short-medium term objectives in our current roadmap. A strong corporation with the Dutch high tech space scene is present through companies and institutes such as: TNO Space, Airbus Defence Systems (ADS) Leiden, ISIS and Hyperion Technologies B.V., etc. The current Delfi-Pocket Cube (PQ) development requires an ever further miniaturized ADCS systems whilst the discovery of the potentials of such a system is one of the science quests of this mission. This in strong relation to small instruments and sensor development for PQ’s and CubeSats. A lens-less or planar camera design, being a new research area, can serve as a PQ optical payload. The research towards its realization is done in corporation with the faculty TNW. The science potentials of such an instrument have to investigated in close SE harmony with the ADCS and mission design. The market for CubeSats offers a huge potential for Earth Observation (EO) satellites with a high re-visit time. However, the development to sustain a higher spatial resolution better than 4 m is a challenge. It requires a stable EO platform to acquire accurate EO images from Very Low Earth Orbits (VLEO) in the altitude range 230 – 380 km. To obtain a pointing accuracy down to 1 degree and a high stability of the spacecraft, severe difficulties are present due to the nature of the atmosphere at these altitudes. The thermosphere is affected by the solar flux and magnetic indices which impose significant temperature and density fluctuations. The control of these issues, combined with free molecular flows, requires a complex model to predict any disturbance to be encountered. Stable Highly Accurate Pointing EO (SHAPE) 6U CubeSat design. This novel CubeSat design concept can in principle yield an exceptionally stable satellite for high-resolution VLEO EO. SHAPE uses the principle of momentum conservation by integrating a large momentum wheel in the centre of the spacecraft composed of two 3-unit CubeSats. Its rotational speed is increased up to 7000 rpm to ensure that external disturbance torques are effectively counteracted. It was sized on the largest (aerodynamic) disturbance yielding a design torque of 0.014 Nm, 0.469 kg mass , 15 cm radius and 1 cm thickness. A resisto-jet developed at the TU Delft is used to accelerate the wheel to the high speed. Additional power is delivered by a battery inside the wheel, adding required mass as well. To ensure stability, dedicated refined liquid dampers can be designed (another SSE competence) to attenuate additional vibrations and residual nutation. Momentum and reaction wheels are commonly used in satellites. 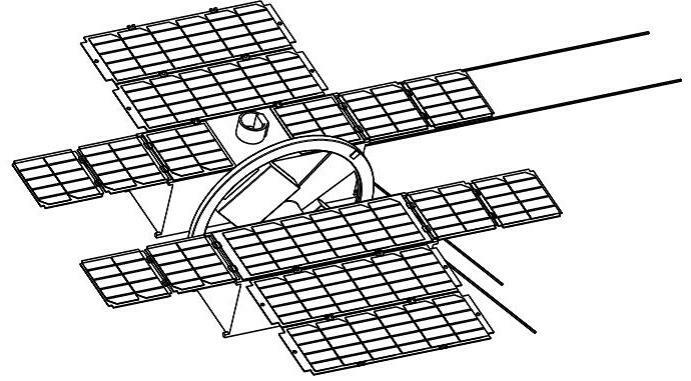 Literature shows that this is the first application of a substantial momentum wheel using a novel type of a magnetic bearing in a VLEO NanoSat. SHAPE provides with an innovative, out of the box, and simple solution, by tackling the problems of instability of EO from a VLEO spacecraft. Its costs are very competitive, roughly estimated 400 k€ for the platform, including a dedicated optimised camera concept version ANT-3A derived from the ANT-2A Cubesat camera. These cameras were developed up to a healthy phase-A level design earlier by the TU Delft. However, a variety of cameras can be used, inexpensively and efficiently, with this platform using a standard plug & play interface. The momentum wheel plays the dominant role in stabilising the platform, using a simple, trusted, reliable and efficient method. Currently an MSc student is working on the refinements of the ADCS design, especially on the options to stabilize the momentum bias wheel in the critical attitude acquisition phase. Deployable optics have the potential of revolutionizing the field of high resolution Earth Observation. By offering the same resolutions as a conventional telescope, while using a much smaller launch volume and mass, the costs of high resolution image data can be brought down drastically. In addition, the technology will ultimately enable resolutions that are currently unattainable due to limitations imposed by the size of launcher fairings. To explore the possibilities and system complexities of a deployable telescope, a concept study was done to design a competitive deployable imager. The concept of a Deployable Space Telescope (DST) is a key part of research with goal to obtain a ground sampling distance of 25 cm from an orbital altitude of 550 km. It offers an angular field of view of 0.6° and has a panchromatic channel as well as four multispectral bands in the visible and near infrared spectrum. The segmented primary mirror consists of four tapered aperture segments, which can be folded down during launch, while the secondary mirror is mounted on a deployable boom. In its stowed configuration, the telescope fits within a quarter of the volume of a conventional telescope reaching the same resolution. A joint TU Delft and ADS Leiden team is working on a first breadboard demonstrator project to be launch on the VEGA launcher in two years. 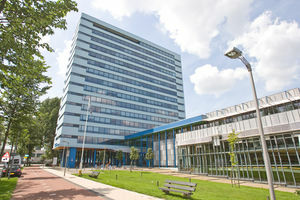 The project is supported by ESA, TNO Space, ADS Leiden and multiple faculties within the TU Delft. The science potentials of such an instrument have to investigated in close SE harmony with the ADCS and mission design. In a strong corporation with TNO Space the mission and ADCS design of a new generation of small optical payloads like Spectrolite and Tropolite is being developed. Tropolite is the small scale version of the famous Dutch Tropolite instrument. Two MSc students are currently doing their thesis work in this research field. H. Klinkrad and B. Fritsche, Orbit and attitude perturbations due to aerodynamics and radiation pressure, in ESA Workshop on Space Weather, ESTEC, Noordwijk, Netherlands, 1998. K. Anflo, T.A Groenland, G. Bergman, M. Johansson, and R. Nedar, Towards Green propulsion for Spacecraft with ADN-based Monopropellants, 38th AIAA Joint Propulsion Conference, AIAA Paper, vol. 3847, p. 2002, 2002.